Series Note: The best way to experience Washington D.C.’s National Gallery of Art is in short intervals. The thing is like the Costco of art museums! Too often when people go they stay too long and look at too much, and it all becomes a big, beautiful blur. So this will be an ongoing series of posts that use a room or even just a painting from that museum and connect it with a song or poem to create what I hope is a productive and satisfying 15 minutes. Yep, today we're starting with gallery one. No, we’re not doing every gallery ... don’t worry. We just happen to be starting in the first room. So, when you walk into that room, this is one of the paintings that you will see. 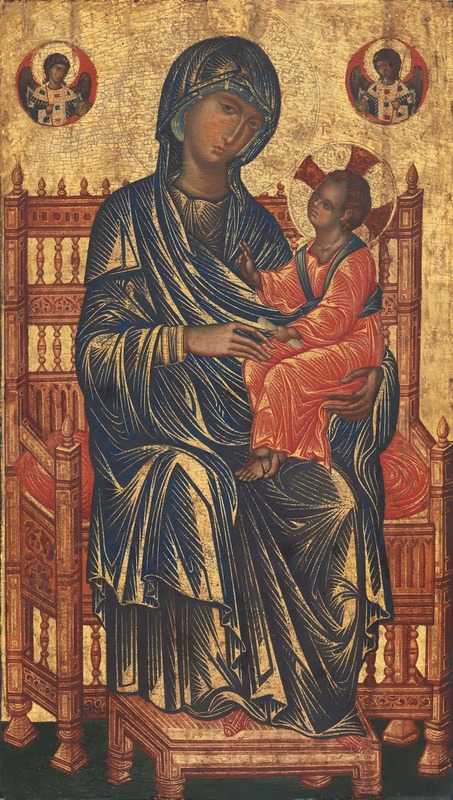 It is a 13th Byzantine painting of the Blessed Virgin Mary holding the Christ child. Perhaps the first thing you might notice is the sadness on Mary’s face. On her lap is her child, and not just her child but the Savior of the world. But his red robe hints at how he will bleed from every pore, and the humble maidservant of the Lord already reflects her deep sorrow. Mary wears the traditional blue robe, and that color is associated with truth and integrity. Mary and Christ are seated in a grand, celestial throne, and two angels accompany them. The throne seems to rest on a sort of green stage. The emphasis in the painting seems to be on Mary and Christ. The background is a simple, plain, golden wall. Mary’s robe is a series of interesting lines, shapes, and patterns. Christ’s robe is similar. The chair seems a little awkward if not clumsy by our standards. They seem to look straight out at us, but the chair seems to … move to the side. So one quick note about the approach to painting here: the artist seems to treat the surface of the painting as something to be decorated. There is a hint of three dimensions, but no one is going to mistake the painting for window. Some centuries later, artists are going to try to make paintings seem like windows, with the action happening on the other side of the painting's surface. That is not the approach of this Byzantine artist. The painting is not meant to trick your eye into believing that it is a window. Instead, the painting is meant to inspire the eye and the mind and the heart and the soul to seek the joy and the blessings that came into the world via Mary and Christ. So let’s listen to a couple of pieces of music that might make this painting even more interesting. The first piece is a portion of medieval plainchant. Listen to the music, perhaps follow along with the English translations, turn down the lights, and what happens? Does the simplicity and beauty of the music almost transport the soul? Do the music and painting lift you above the daily and mundane? Do they come together to invite a meditation on or even a connection with the Divine? Okay, so now let’s listen to another piece of music. What is this piece like? How is it similar to the plainchant? Did you notice the echo? And what happened when you heard him say, “talking like this?” And did you notice the anachronism? (That is when something is out of chronology, or out of its time period.) The voices that accompany the main voice create harmonies. Plainchants feature either one melody or melodic lines treated individually. They do not (generally) harmonize. And did you laugh when this became a sort of medieval barbershop quartet? Finally did you find the self-referentiality funny? (Self-referentiality is when the singer refers to himself.) What is funny about self-referentiality is that the painting and the plainchant try to move you, viewer and listener, away from the art and toward God. They Might Be Giants do exactly the opposite, inviting you to notice the song and “plight” of the singer. So, does this show the world we live in? Have we become out of tune with quiet, contemplative things? Do we expect visible realities and therefore reject what is meant to move one toward higher realities? Does the self-referential, perhaps, show us how easy it is to be trapped in the mundane details or in the busyness of daily life such that we miss out on something valuable? Or is the They Might Be Giants song just a fun spoof? Image credit: National Gallery of Art (used with permission).